These wooden spoons just might be the best wooden spoons you will ever own. Not only are they beautiful, but they are extremely strong and durable. They are very common in Bahia where they are known as Colheres de Pau da Bahia and are hand-made with Paraju wood. 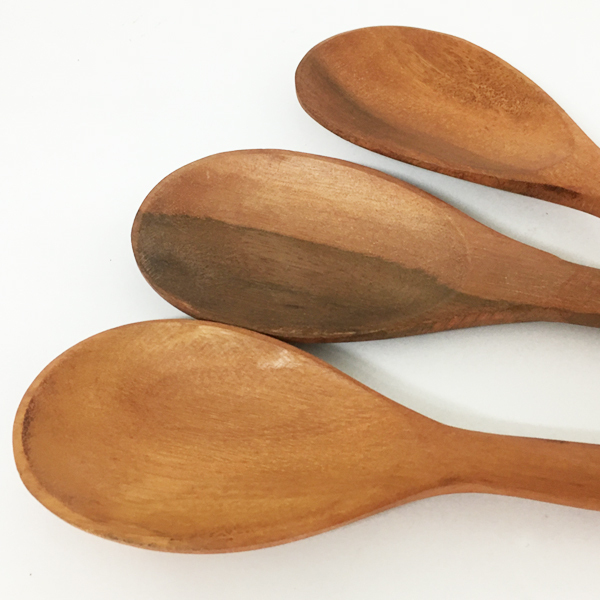 Paraju is an incredibly strong, dense tropical hard wood used for heavy construction and flooring applications; however in the hands of talented artisans, they make the most beautiful medium to dark reddish brown and extremely durable spoons. The wood slightly darkens with age and use. Wooden utensils need special care in order for them to last. Even though these spoons are exceptionally strong, not taken care of properly, they can crack and lose their attractive finish. Here are a few tips to keep your wooden utensils a long time.